Are plumbing problems complicating your bathroom remodel? Perhaps a plumber has told you your dream bathroom is not possible because of pipework limitations? 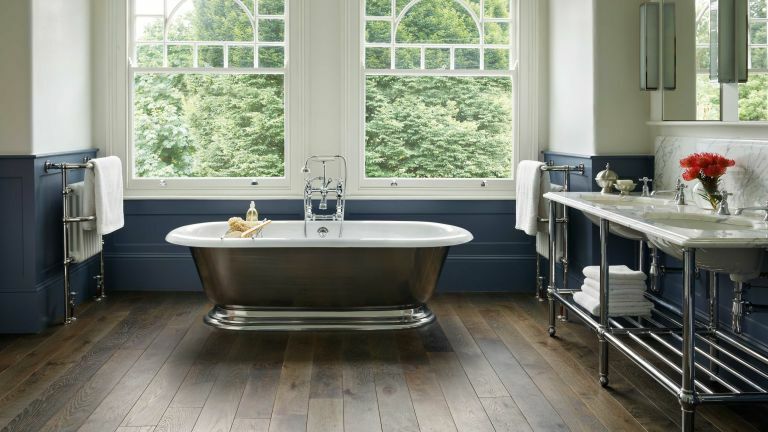 Or maybe you have already picked out the perfect bath but have no idea if the freestanding tap you have chosen is even feasible? If this sounds at all familiar, read on. Installing bathroom plumbing might come as an afterthought in your bathroom design process, but really, it should be at the top of your list, along with the most important decisions that you make. Why? Well-concealed and clever plumbing can help to create the perfect bathroom for your household whether you’re looking for a luxury, spa style bathroom, or a practical little wet room. These are our top 10 tips and tricks for installing plumbing in your bathroom, getting around some of the common problems and ensuring that the end result is perfect for you. Visible pipework can be an eyesore in a new bathroom, but early planning can help you find a solution whether you are updating or fitting a brand new bathroom. Although it’s likely that tiles will need to be removed, it is essential to chase out walls and lift floors to hide hot and cold plumbing and waste pipes if you want a high-quality, clutter-free finish. Where pipework can't be concealed in the walls, or ceilings, you can box it in. Some bathroom furniture, will also cover pipes. Waste pipes tend to be positioned on outside walls, so when planning your new bathroom take this into consideration. Banking the toilet, sink and bath/shower together helps keep pipework in one area, but don't do this to the detriment of usability. Small spaces can make plumbing a logistical nightmare. Not only does the plumber need room to work, but they also require plenty of room for the fittings they are using. Plastic fittings can be easier to retrofit because the flexible pipe can be threaded through joists and around corners, without needing joints. Adaptors from copper to plastic are available to extend existing systems. Plastic is also quicker to fit than copper, resulting in lower labour costs. Waste pipes need to be installed sloping down to ensure the water runs the right way. This needs to be a minimum of 10mm fall for every 4m of pipe which can lead to insufficient fall within the floor void under baths or showers (especially under low-level or flush shower trays). In this case consider raising the floor level to create a void. You could run the waste between and below joists, boxed in at ceiling level in the room below. Or, where this is not an option, consider building a plinth to raise the bath or shower above floor level and hide the pipework below. This can make more of a feature of the space too. It’s a good idea to put isolation valves on every pipe so that they can be shut off for maintenance. This enables you to make changes or fixes without the whole bathroom being out of order. Valves can be inline, but the neatest solution is to have a single hot and cold manifold, with individual and master shut off valves located behind a removable panel for easy access. Looking to add a bathroom or WC in a part of your home that is too far from the main drain? Or maybe you have recently converted a basement and are facing the complications of installing a loo where gravity is working against the waste pipe? Ideally, all new bathrooms will be connected to a 100mm soil pipe, but where this is not possible, a flexible small-bore waste pipe and a pump with a macerator will allow a bathroom to be fitted in even the smallest or most awkward to reach of spaces. Find out more about designing a small bathroom. Standing water in your shower tray is the first sign that your drain might be blocked. If this is not the case, check that the waste pipe width is sufficient for the increased volume of water from a more powerful shower. For a very large showerhead or a power shower, use a 50mm waste pipe rather than the standard 40mm size, to cope with the high flow rate. This should see off any previous issues with a slow draining shower. Read more on choosing a shower. Smelly drains are another sign of a blockage. In the first instance, unblock the sink or drain in question. If you are still having issues, a blockage might not be the problem and it is time to call a plumber. Where the run of waste pipe is more than 2m, the displaced waste water can pull air from nearby waste traps instead of from the vent pipe, siphoning the water seal, creating a gurgling sound and releasing drain smells. This can be avoided by having anti-siphon valves or anti-siphon traps fitted in the waste traps. If you are at the design stage, you might also want to consider arranging sanitaryware to keep the waste pipe as short as possible. Before you choose a shower, check the pressure on your hot and cold supply – many shower and tap mixers require 3-bar or more, and won’t suit a traditional gravity-fed (header tank) system. The result would be a weak, unsatisfying shower. A shower head for low water pressure systems can help, but won't solve the problem. Instead, you need to consider the alternative. One is to fit a pump to boost the mains water pressure from a gravity-fed system. Good pumps costs from around £100 and will need to be fitted by an electrician. Alternatively swap to a high-pressure electric shower (more on this below), or if you still want a mixer shower, check that your combi-boiler can deliver adequate hot water flow rate. If the bathroom is on the end of a long plumbing run, hot water can take ages to arrive. You could connect the end of the run back to the hot water cylinder and fit a bronze pump on the loop so hot water circulates (a timer will save energy). Taps will then run hot instantly when opened. If you are adding a new shower in the bathroom, but your existing combi boiler lacks sufficient hot water flow or pressure, consider fitting an electric shower that heats its own hot water on demand, fed by water direct from the rising mains. Don't forget you will need to find a registered electrician for the job, as well as a plumber.